Connect the LAN port of the PC to the LAN port of the Satellite Router using an Ethernet cable. Launch the Web browser of choice. 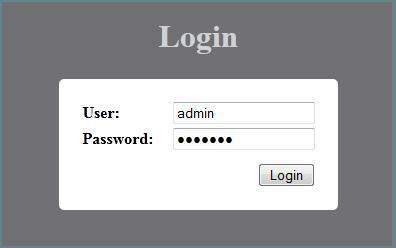 Enter a User name and Password when the Login page displays. On the initial login, enter the default name of admin and the password of iDirect. Click Login to complete the login process. 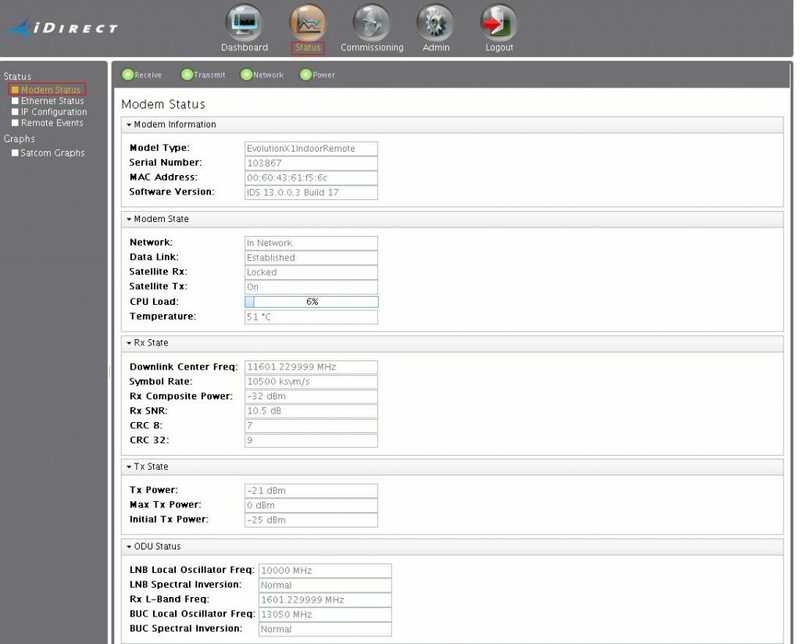 The Web iSite application automatically connects to the X1 Satellite Router and the CPU processes that perform the Web iSite functions. What You Can Do with Web iSite? Real-time display of the Satellite Router’s LED status. A dashboard view of high-level remote information such as if the remote is in network, if it’s locked to the satellite, and real-time events. Status and monitoring views of real-time modem information and events, Ethernet receive and transmit connections, and IP configuration and information. Remote commissioning tools, including tools for lookup angle calculation, antenna pointing, and cross polarization. 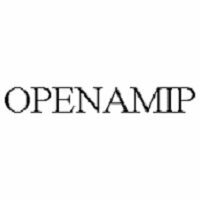 Administration tools for loading new packages and options files. Factory Default Mode restart to reset the Satellite Router to factory default settings. The Dashboard is the default landing page—displayed whenever Web iSite is launched. From the Dashboard, access is provided to basic information such as the remote’s IP Address, whether the remote is in network, if it’s locked to the satellite, as well as a view of real-time remote events. The Status pages provides a view of some of the key operating parameters of the Satellite Router and access to graphic visuals of the Satellite Router’s network satellite traffic. The Modem Status page is the default page of the Status page group of Web iSite. 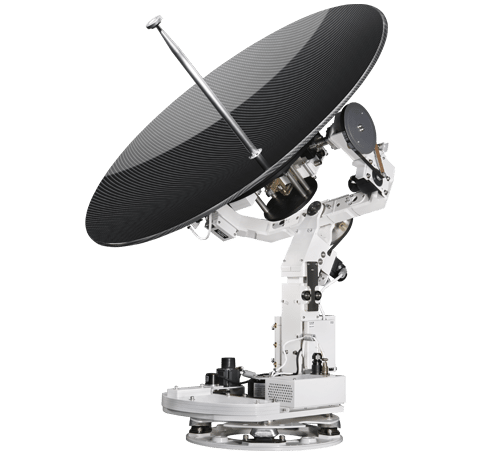 This page provides specific modem information and operating parameters of the X1 Satellite Router. Modem Information – This section provides key identifier information for the X1 Satellite Router. For example, the Model Type, the device Serial Number, the Satellite Router’s Ethernet MAC Address; and the Software Version. Modem State – provides information relative to the modem’s status regarding the network, as well as specific modem operating parameters. Rx State – reflects the modem’s receive operating parameters. Its subsections shown are the Downlink Center Frequency and Symbol Rate, Rx Composite Power, Rx SNR; and the CRC 8 and CRC 32. Tx State – The Tx State section reflects the modem’s transmit operating parameters. Its subsections shown are Tx Power, Max TX Power, and Initial Tx Power. ODU Status – This section reflects key operating parameters of the Block Up Converter (BUC) and the Low Noise Block (LNB) amplifier devices that are associated with the Satellite Router. It provides pertinent information about the Satellite Router’s Ethernet connection, its receive data link, and its transmit data link. This information is presented in the Connection, Transmitter, and Receiver sections. Connection – This section provides key Ethernet connection information for the local LAN subnet to which the X1 Satellite Router is connected—for example connection Speed, Duplex Mode, the IP Address, MAC Address, and the Subnet Mask. Transmitter – This section tracks and displays the total number of Ethernet Frames transmitted by the Satellite Router, the number of Dropped Frames, and the number of Error Frames, seen by the Satellite Router, since the modem was last restarted. Receiver – This section tracks and displays the total number of Ethernet Frames received by the Satellite Router, the number of Dropped Frames, and the number of Error Frames, since the modem was last restarted. It provides important configuration information about the network in which the Satellite Router is connected. This information, which reflects data contained in the configuration database, is presented in the LAN Interface, Management Interface, DHCP, Static Routes, and Multicast Group sections. 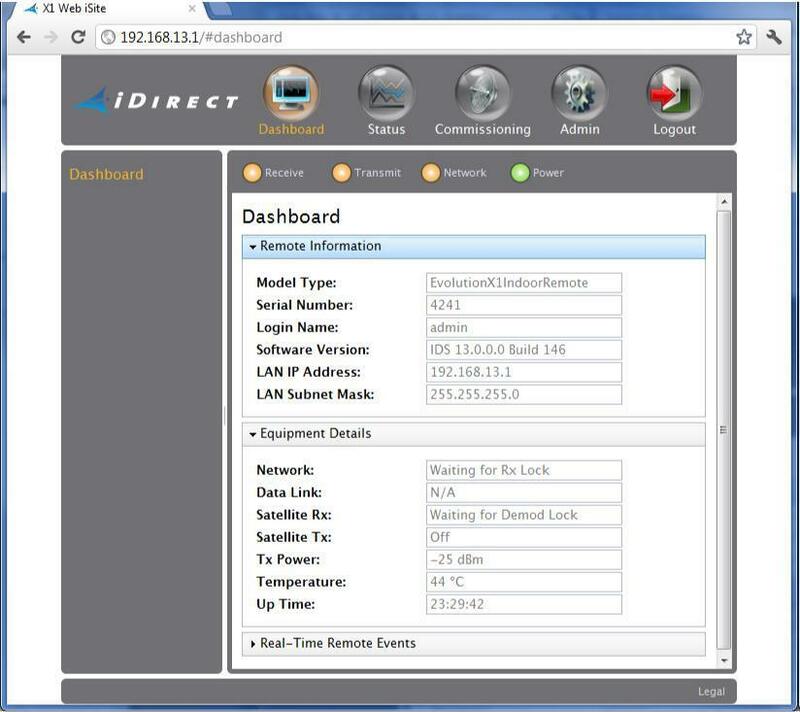 LAN Interface – In an iDirect Network, the LAN Interface refers to the IP address through which the remote communicates with the LAN network behind the Satellite Router. 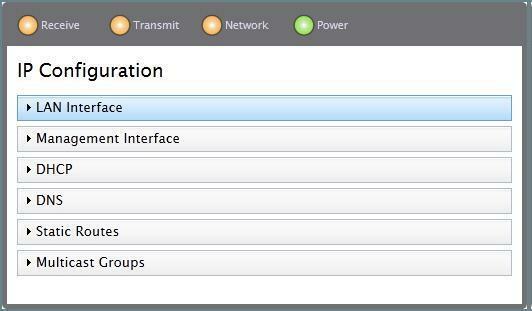 Management Interface – In an iDirect network, the Management Interface refers to the hub side of the network. Hence, the remote’s Management Interface IP Address represents the remote’s virtual interface on the default VLAN. DHCP – The DHCP mode is configured for Relay when an existing or separate DHCP server is used at the hub location. In this mode only the IP Address of the relay station is shown, in the Relay To field. The DHCP Mode is selected as Server if the X1 remote is enabled to act as the DHCP Server. In this case, the section is extended to show the Lease Range and Lease Time; the IP addresses for both the Primary and Secondary DNS; and for the Default Gateway. DNS – If the DNS Mode value is Disabled, the section only shows the DNS Mode field—no other fields are shown. Static Routes – This page section displays the list of IP Addresses configured in iBuilder as Static Routes for the X1 Satellite Router. Multicast Groups – Using the Direction to indicate the flow of traffic, and the IP Address of the multicast group, this section lists the persistent Multicast Groups in which the X1 Satellite Router is a member. When the remote is in operation, this page logs the events of the X1 Satellite Router, displaying the last 40 events that have occurred. This area, is also a monitoring and troubleshooting tool that is used to aid in resolving problems that may exist with the remote. With the information provided in this window, an iDirect TAC representative can perform an investigation and analysis of problems with the remote and quickly pinpoint problems. 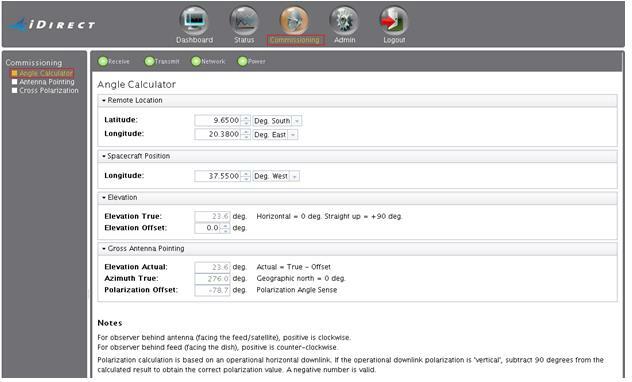 The Web iSite Angle Calculator page, shown in Figure, is a Web iSite tool designed to assist with gross antenna pointing. Given the appropriate values, the look angle calculator determines the Polarization Offset, Azimuth True, and Elevation Actual. Remote location – This section is used to enter the Latitude and Longitude for the X1 Satellite Router’ exact location. Spacecraft Position – the Longitude is entered for the satellite that is being used. 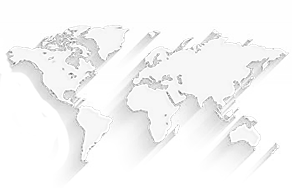 Elevation – an Elevation Offset is entered to derive the correct value for Elevation True. Gross Antenna Pointing – The look angle calculated values for Elevation Actual, Azimuth True, and Polarization Offset are displayed in this section. The Web iSite Antenna Pointing page, is a Web iSite tool designed to assist with antenna pointing. The tool itself is a color-coded graphical voltage display that simplifies the task of locking on to the downstream carrier for a specific network. As the antenna azimuth plane is manipulated in a slow sweeping motion, the graph displays a voltage reading in the range of 12-24 volts to indicate the signal strength and when the remote is successfully locked onto the correct satellite and outbound carrier. As the antenna azimuth is moved, the graph will turn red, then yellow, and finally completely green as there is a lock on to the downstream carrier. This test page supports the putting up of a modulated or unmodulated continuous wave (CW) carrier as part of the test. The three sections of this page include Transmit Frequency, Transmit Power, and Modulator. Transmit Power – The Adjust Transmit Power field is used in performing the 1 db compression test, while the Network Operator continues to monitor the Carrier Wave (CW). The value, which is generally incremented in 1 db adjustments under the advice of the satellite provider’s operator, may only be adjusted after the test is started. 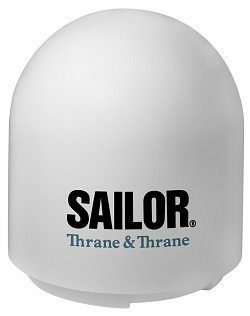 The transmit power adjustment value may also be adjusted downward if the BUC is already saturated and the 1 db adjustment shows no further increase in power. 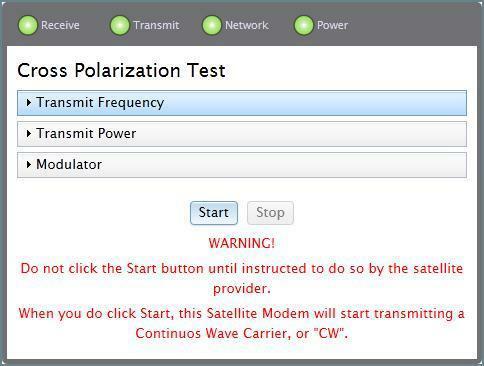 Modulator – The Cross-Polarization test supports the testing of a remote by transmitting either a modulated or unmodulated carrier at a specific uplink frequency. Using this section, and the Modulator PN radio buttons, an installer can control the ON and OFF switching of the CW carrier. The modulation should only be switched on after receiving instruction to do so by the Satellite Provider operator. This page group provides additional tools for assisting installers or technicians with the task of troubleshooting or commissioning of the remote. Tools are included for loading the software Package and Options file to the X1 Satellite Router, as well as a command console tool for invoking a limited set of commands on the X1 remote. File Management Page – is generally used at the Satellite Router location, during a commissioning phase, to load the necessary files to the X1 remote. The topics in this section describes how these page sections are used, however the Satellite Router Installation and Commissioning Guide must be referenced for complete instructions on performing the installation and commissioning tasks. The X1 Console Page – is a diagnostic and troubleshooting tool to assist with any problems that may arise during the commissioning task, or in any situation where troubleshooting may be required after the X1 remote has been commissioned. The page is comprised of three areas—the command response window, the top most area just under the Console label; the command line, the blue highlighted area beneath the command response window; and the X1 event message window, the bottom message area of the page.